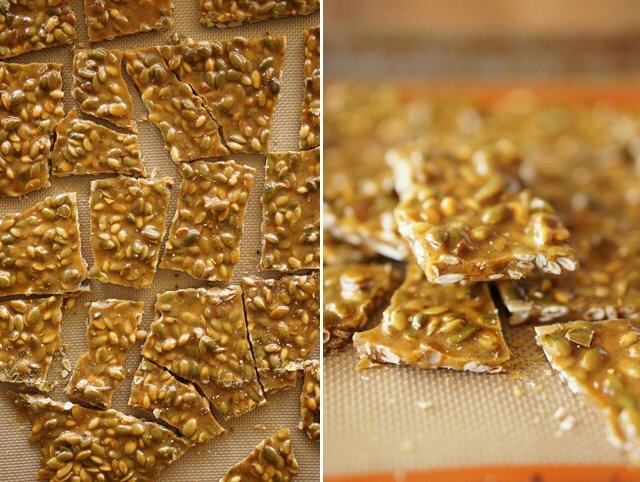 I’m just going to tell you right now that this brittle is a winner. 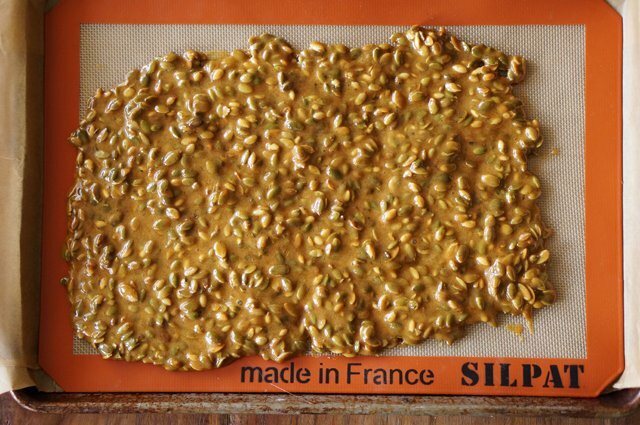 Straight brittle is great and all, but nothing to write home about. However, add toasted pumpkin seeds and pumpkin spices, dip the brittle in chocolate and then sprinkle with more crushed pumpkin seeds and sea salt, and I guarantee you will not be able to stop eating this brittle– your dentist will thank you for all the business. First, toast the pumpkin seeds over medium heat in a pan. Keep the seeds moving so they don’t burn and stop toasting once they start to tan and you can smell the toasted seeds. Prepare a baking sheet lined with parchment paper or a silpat. In a medium saucepan clipped with a candy thermometer (make sure it doesn’t touch the bottom of the pan), heat water, sugar and corn syrup over medium high heat stirring constantly with a wooden spoon until it starts to boil. Stop stirring and let the mixture boil until it reaches 285 degrees. You may have to turn the heat up to high if the temperature isn’t increasing. Stir in the pumpkin seeds and continually stir the mixture so it doesn’t stick to the bottom until the temperature reaches 300 degrees. Remove from the heat and stir in all the spices, vanilla extract, baking soda and butter, just until combined. The baking soda will cause it to bubble up a bit, but that’s normal. Working quickly, pour the mixture over the baking sheet and using the back of a wooden spoon spread across the sheet evenly. 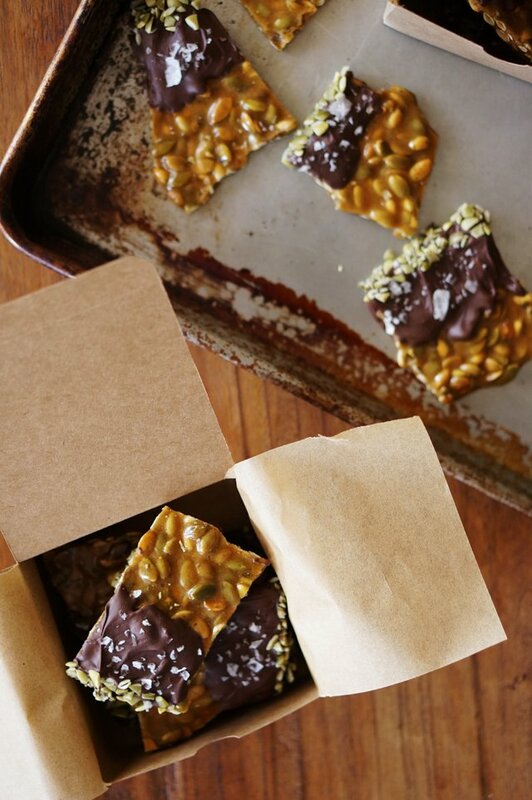 Allow the brittle to harden completely at room temperature, or if you’re in a rush like I was, pop it in the refrigerator for about a half hour or until completely hardened. Temper the chocolate chips to dip the brittle into. I use this microwave method, which starts by microwaving 3/4 of the chocolate in a bowl in 20 second intervals until the chocolate is melted and then stirs in 1/4 of the chocolate to “temper it.” I’m not sure how accurate it is but it’s easy and works well enough for me! Finely chop a large handful of raw pumpkin seeds and place on a dish. 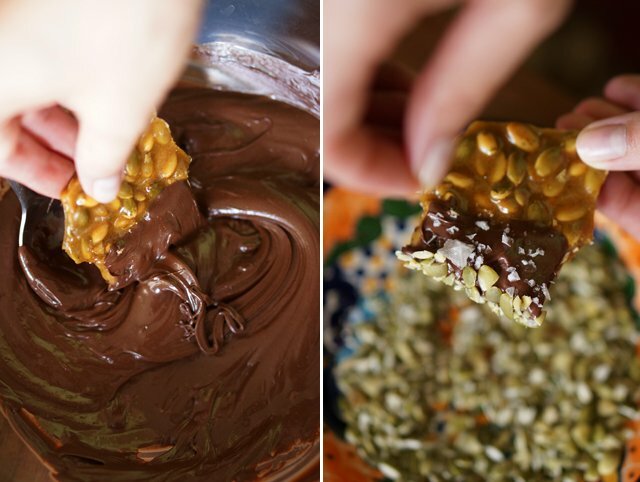 After dipping the brittle in the chocolate, dip the ends in the raw pumpkin seeds and sprinkle with some sea salt. I used Maldon here. 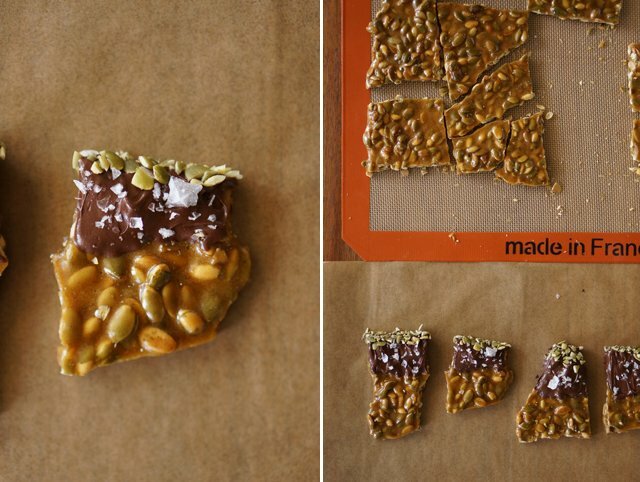 Repeat until you’ve finished the rest of the brittle pieces. Eat the smaller pieces while you’re doing this– it makes the process more fun. To package them for gifts, place them in a box lined with parchment paper. Place a sheet of parchment between each brittle to ensure they don’t stick together. Clean up tip: Melted sugar can be a real pain to clean. Once it hardens good luck trying to get it off your pans. When I’m done with any pans or spoons I used to make the brittle, I fill up the pot with water and boil it all until the sugar is melted and I can easily scrub the sides with a sponge, but carefully since you want to do this while the pot is hot! Thanks for a great recipe! ITs time to make gifts for my coworkers and I’m wondering if its ok to double the recipe? I made it a few years ago in two batches, but am in a hurry this year. Are there any changes that need to be made if I make a double batch? Thanks!!! Glad you liked it Kathy! I’ve never doubled the recipe, but I think that should work– just make sure you have a big enough pot when making the brittle. have you made it without the spice and how is it that? can i use Lyle’s golden syrup instead of corn syrup? do you take mail order’s?? These are a must make every. single. Christmas. They are just so darned good! This looks like such a fabulous recipe for the start of fall. I want try making a fairly large batch of it. Do you think it can be doubled if I use my large pan to make it in? Gorgeous brittles! It looks so professional, totally saving this! I made these last year for the Holidays and they were a hit! I used the pumpkin seeds along with some spicy pepitas for some kick. I have been getting requests to make these again all year long! You’re welcome! Glad it was a hit! 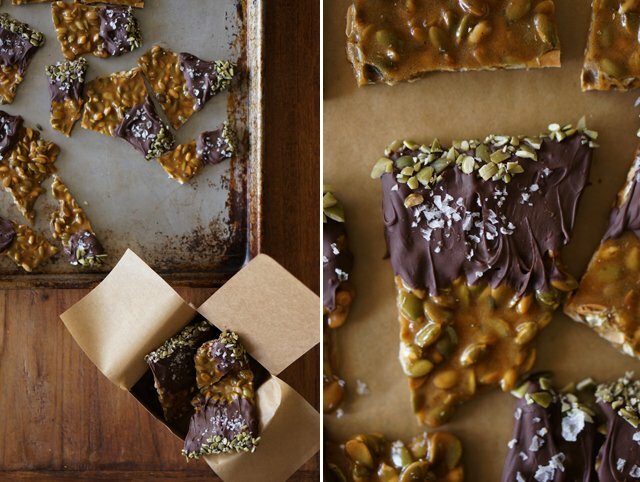 These look amazing and I am planning on making them for X-mas gifts for co-workers – can you tell me how much this recipe yields? As in, how many ways can I split it for gifts? Thanks! Probably enough for 4, but just depends on small you break up the pieces. You could probably get 5 out of one batch. I made this and they are absolutely divine. I did changed the spices bc I didn’t have allspice but cardamom works beautifully. Glad you liked it. 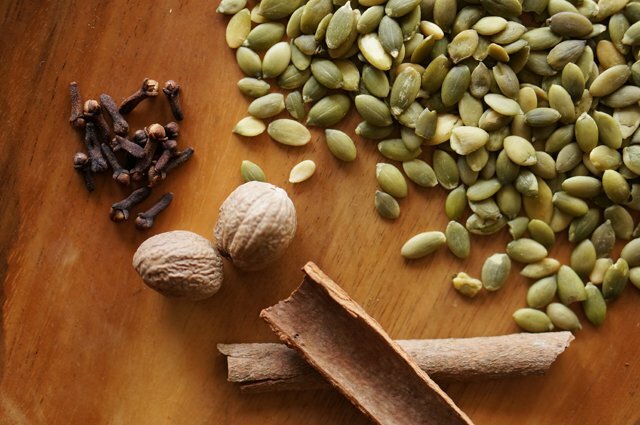 And cardamom is such a great idea– I may have to try that next time! Just made these and the flavor is amazing. 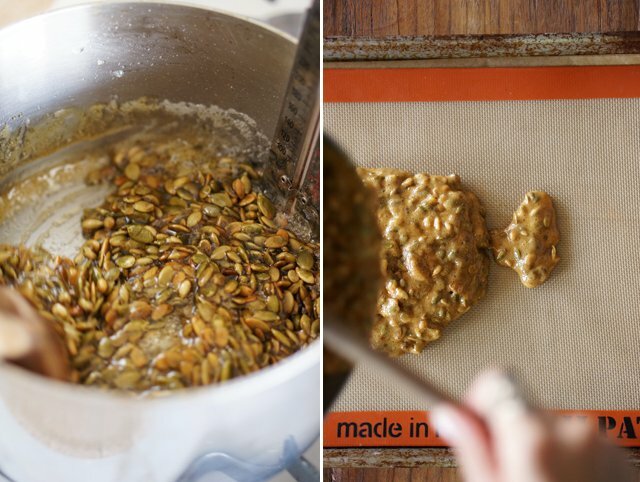 The pumpkin seeds I used are bigger so the brittle came out a little thicker. What variety of pumpkin seeds did you use? Thanks for the great recipe this will be in the recipe box for years to come! Wonderful glad you liked it! I used shelled pumpkin seeds from Whole Foods. Made these for a charity bake contest and. I. WON! THANK YOU!! Oh my heavens! These look soooooooo good!! Can’t wait to try them!! Best thing I ever made, I think! I didn’t even dip it in chocolate (yet). Thanks for the recipe! Oh glad you enjoyed it Tammy! It really is delicious even without the chocolate. 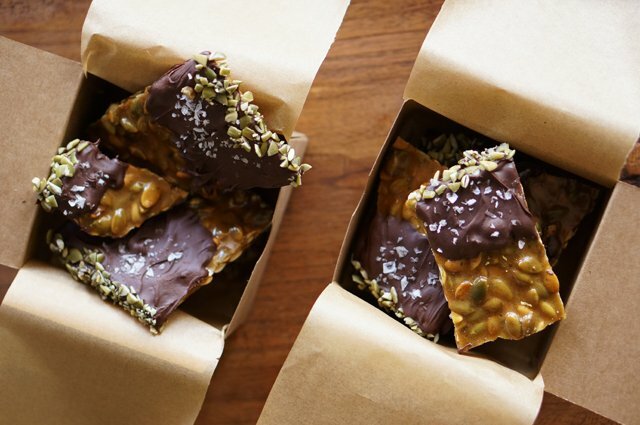 Gorgeous and, yes, I too love my brittle better when chocolate is involved! Chocolate really makes everything better. Thanks Aida! How did you separate the hulls from the pepitas? I bought them in a package without the shell– they’re generally available in markets like Whole Foods. I’ve seen recipes use agave syrup and honey in lieu of corn syrup, so you could use those kinds of recipes and just add the spices and pumpkin seeds in at the end. Hope that helps! you actually managed to take all of my favourite things and put them into one bite! :D!!! delicious. Oh good! That was the goal! Sweet, salty and crunchy?! Count me in! This looks fantastic! Yes such a great Christmas gift idea. The chocolate dip makes them so pretty. I love this idea for pumpkin seeds. I usually just toast them, which of course is delicious, but this one would make great gifts, too! I love toasted pumpkin seeds too, especially when they’re straight out of the pumpkin! 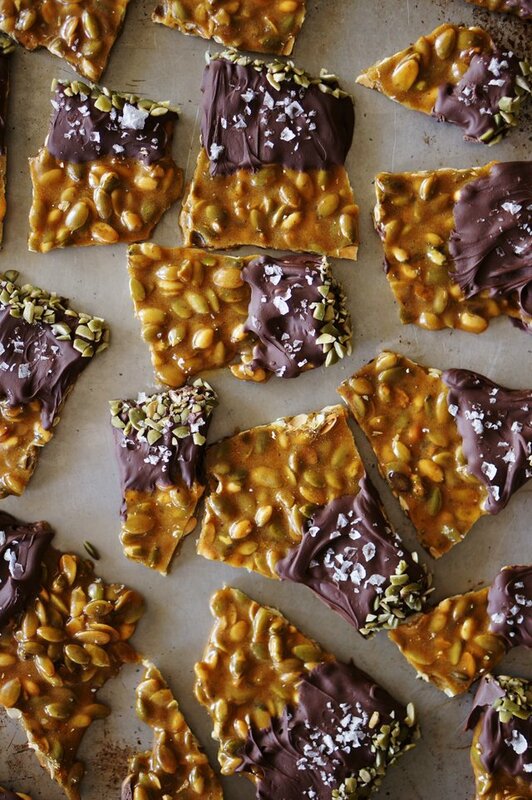 I make brittle every year for Christmas gifts, and I love the idea of using salted pumpkin seeds with the dipped chocolate!! I’m so excited to give it a try. Hope you make these for Christmas this year then! Speaking of gifts, where are mine?! These look delicious! These are so pretty and look delicious! Such a great gift idea! 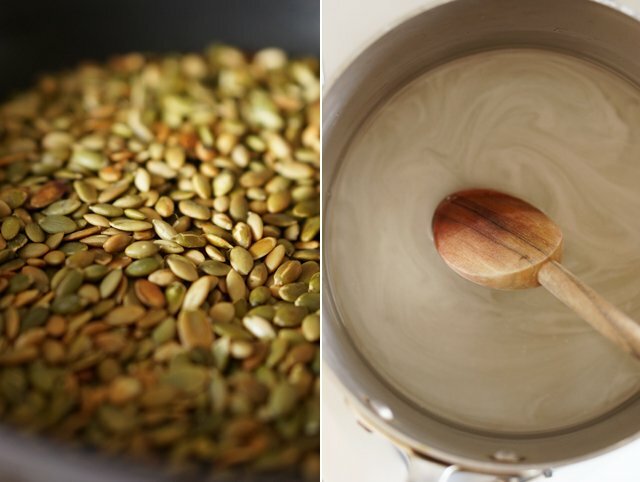 How to use pumpkin seeds: 9 creative recipes. Pumpkin Seed Recipes and Crafts!